As well as a standalone dive at Gorgonia Hole, you can do a drift dive utilising this site. Most of the dive sites at Heron Island are located on the eastern side of the fringing reef that surrounds Heron. Gorgonia Hole is towards the top or northern section of the reef around past The Bommie and Pams Point. It is only a few minutes run in the dive boat to this location. 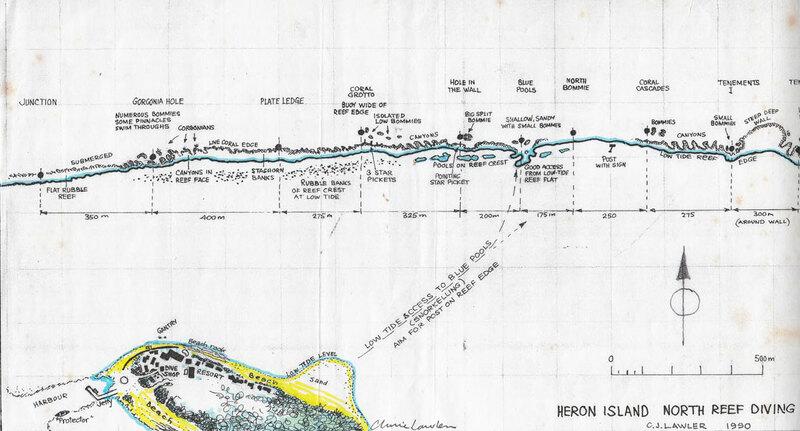 On my trip there in June 1989 and later in October 1989 for the Heron Island Dive Festival, I dived this site four times, including a night dive. Coral Plate (or Plate Ledge as it appears to be called in 2008) is located to the south-west of Gorgonia Hole. There was a mooring at Coral Plate which was on a small coral outcrop. This is in a small bay. The reef runs in an west-north-west to east-south-east direction and sort of snakes its way along with some small bays. Once on the bottom you will see the fringing coral reef has a bays right opposite the mooring. The depth will only be about six to nine metres and you are unlikely to get over 15 metres on the dive. Head to the west along the wall and you will see the numerous bays. The first one you come to after the mooring has two overhangs that run back into the wall a bit. These can be home to crayfish and moray eels. The next couple of bays have medium sized coral bommies off them. Check out the bays and the bommies as you go. Off the wall look out for turtles and sharks, we saw some white-tipped reef sharks on this dive. The fourth bay has no bommie but is just before the end of the dive. A short distance along you will see a larger bay. This has a large oblong shaped bommie that sits 10 metres or so off the main wall. The mooring for Gorgonia Hole is on the bommie. A very nice dive, with lots of the usual coral fish to be seen.